Asthma and associated phenotypes are complex traits most probably caused by an interaction of multiple disease susceptibility genes and environmental factors. Major achievements have occurred in identifying chromosomal regions and polymorphisms in candidate genes linked to or associated with asthma, atopic dermatitis, IgE levels and response to asthma therapy. The aims of this review are to explain the methodology of genetic studies of multifactorial diseases, to summarize chromosomal regions and polymorphisms in candidate genes linked to or associated with asthma and associated traits, to list genetic alterations that may alter response to asthma therapy, and to outline genetic factors that may render individuals more susceptible to asthma and atopy due to environmental changes. The prevalence of asthma, allergic rhinitis and atopic dermatitis (AD) has dramatically increased over the past decades. These atopy-related diseases are the most common chronic disorders in childhood in Western societies. Several epidemiological studies have evaluated environmental risk factors that may explain the steady increase of allergic disease. (Note: in this article, allergic diseases/atopic disorders include asthma, allergic rhinitis and AD. Atopy-associated phenotypes/traits include, in addition, allergic sensitization, elevated total serum IgE and eosinophilia.) There is growing evidence that contact to bacterial antigens (such as endotoxin) and viral infections in early childhood is protective with regard to development of allergic disease in later life [1,2,3,4,5,6]. Although changes in lifestyle significantly contribute to disease expression, heritability has been shown to play a major role in the pathogenesis of allergic disease. Multiple twin and family analyses strongly imply a genetic basis for atopy-related traits (for a review, see ). A recent study of 11,688 Danish twin pairs (comparing identical and non-identical twin pairs) suggested that 73% of asthma susceptibility is due to genetic factors . However, atopy-associated phenotypes, including asthma, do not appear to follow any Mendelian inheritance pattern, which is characteristic for complex genetic (multifactorial) traits. The dissection of these traits is hampered by phenocopy, incomplete penetrance, and genetic heterogeneity . The complexity of the genetics of asthma and other atopy-associated phenotypes is reflected by an increasingly large number of chromosomal regions showing (weak to moderate as defined in ) evidence for linkage, as well as various genetic variations in multiple candidate genes that are associated with asthma and associated phenotypes. The majority of studies on genetics of complex traits to date have been based on microsatellite marker (synonym, short tandem repeat polymorphisms [STRP]) analyses. These genetic markers (whose biological function is as yet unknown) typically contain a variable number of tandem repeats of dinucleotide, trinucleotide or tetranucleotide DNA sequences (e.g. the tetranucleotide [TATA] n ). The high degree of polymorphism results in great variation between individuals. Short tandem repeat polymorphisms of known location are found densely spaced throughout the genome and are used for genome-wide searches as well as for the analysis of candidate gene regions. Most studies on the genetics of asthma are based on allele sharing methods, transmission disequilibrium test (TDT) analysis, or tests for associations. The allele sharing methods approach involves testing how often a genetic marker (or a chromosomal region) is shared by affected pedigree members. If allele sharing occurs significantly more often than expected by chance, linkage of the particular marker and disease can be assumed, indicating that the chromosomal region containing the genetic marker also contains a gene that contributes to disease expression. The TDT approach is based on genotype analysis of affected subjects (no siblings are required) and their parents. The TDT tests whether genetic marker alleles from heterozygous parents are transmitted as frequently as expected by chance (by random, each parental allele is transmitted with a chance of 50%). Overtransmission of a particular marker allele indicates linkage of this allele with the respective 'disease' allele. Association studies are usually applied once polymorphisms in candidate genes for asthma/atopy have been identified. Results from linkage studies (genome-wide searches and candidate gene region analyses) are summarized in Supplementary Tables 1 and 2 (see also [10,11,12,13]). Multiple chromosomal regions were related to asthma and atopy. Few regions, however, have shown evidence for linkage in more than one population (Supplementary Table 2), which may be due to racial differences, to different definition of phenotypes, or (most probably) to insufficient numbers of affected sib-pairs in different study populations. The first successful attempts have been made to pool data from genetic studies of asthma and atopy in order to analyze major candidate gene regions [14,15]. AA, African American; AD, Atopic dermatitis; BHR, bronchial hyperresponsiveness; C, Caucasian; eos, eosinophil count; H, Hispanic; ns, not specified; RAST, radio allergo sorbent test; ST, positive skin test. *P ≤ 0.01, **P ≤ 0.001, ***P ≤ 0.0001. † Statistical significance (P ≤ 0.05) in both tests, likelihood ratio Χ2 test and transmission disequilibrium test. ‡ Only affected individuals, neither number of all individuals nor number of sib-pairs specified [17,18,38,S1,S2,S3,S4,S5,S6,S7]. Despite the high degree of inconsistent findings, it is intriguing that chromosomal regions linked to asthma have also shown evidence for linkage to other inflammatory and autoimmune diseases (such as psoriasis, inflammatory bowel disease, type I diabetes and multiple sclerosis). Becker et al. noted that susceptibility genes for various autoimmune and inflammatory diseases (including asthma) appear to cluster in 18 distinct chromosomal regions, implying common genetic elements in inflammatory disorders . This speculation is further supported by two recent genome-wide searches for AD susceptibility genes. Regions linked to AD (Supplementary Table 1) have also been linked to psoriasis in other studies [17,18], suggesting that common genetic elements are involved in dermal inflammatory disorders. Multiple genes are involved in the allergic inflammation (shown in Supplementary Figure 1). Multiple single nucleotide polymorphisms (SNPs) in candidate genes for asthma and atopy have been identified, and they are presented in Supplementary Table 3. The (often conflicting) results have to be interpreted with caution, since multiple genotypes are commonly tested for a large number of atopy-related (sub)phenotypes (using various statistical approaches) in often considerably small sample sizes. Therefore, type 1 errors (false-positive results) are likely to occur. In addition, publication favors positive results and, therefore, many negative studies have not been published. Simplified cartoon of the allergic inflammation showing the mechanisms and molecules involved starting from antigen-presentation to organ-specific allergic reactions. Outlined are most candidate genes for atopy-associated phenotypes that have been analyzed to date (superscript numbers refer to Supplementary Table 3). APC, antigen presenting cell; AG, antigen; B7, costimulatory molecule B7; CC16, Clara cell protein 16; CCR5, CC chemokine receptor 5; CD, cluster of differentiation; CD40L, CD40 ligand; ECP, eosinophilic cationic protein; FcεR1-β, Fc epsilon receptor 1 beta (IgE receptor); GSTP1, glutathione-S-transferase 1; HLA, human leukocyte antigen; IFN, interferon; IL, interleukin; IRF-1, interferon regulatory factor 1; LT, leukotriene; LTC4, leukotriene C4 synthase; MBP, major basic protein; NO, nitric oxide; PAF, platelet activating factor; RANTES, regulated on activation, normal T cell expressed and secreted; STAT, signal transducer and activator of transcription; TCR, T-cell receptor; Th, T helper cell. Divergent positions of identical mutations are due to different database accession numbers used for reference. * Numbers refer to molecules in Supplementary Figure 1. † Nomenclature as in references. β2-AR, β2 adrenergic receptor; BHR, bronchial hyperresponsiveness; CC16, Clara cell protein 16; CCR5, CC chemokine receptor 5; CD, cluster of differentiation; FcεR1-β, Fc epsilon receptor 1 beta (IgE receptor); FVC, forced vital capacity; FEV1, forced expiratory volume in 1 s; GSTP1, glutathione-S-transferase 1; HLA, human leukocyte antigen; IFN, interferon; IL, interleukin; IL-4/13 R, interleukin 4/13 receptor; IRF-1, interferon regulatory factor 1; 5-LO, 5-lipoxygenase; LT, leukotriene; LT-α, lymphotoxin α; LTC4, leukotriene C4 synthase; NO, nitric oxide; PAF, platelet activating factor; RANTES, regulated on activation, normal T cell expressed and secreted; STAT6, signal transducer and activator of transcription 6; TCR, T-cell receptor; TNF, tumor necrosis factor. Many SNPs listed in Supplementary Table 3 have been tested for functional differences in vitro. However, when several (potentially) functional SNPs are expressed in one (regulatory region of a) gene (e.g. IL-4Rα, IL-13, beta-2 adrenergic receptor [β2AR]), they are likely to interact. The individual analysis of SNPs may therefore not reflect in vivo gene function, as a recent study on β2AR haplotypes demonstrated (see 'β2-agonists' subsection). (Note: a haplotype is a particular combination of alleles in a defined region of a chromosome. It is used to describe combinations of polymorphisms in a gene/chromosomal area.) In vitro differences in gene expression or function due to SNPs therefore have to be interpreted with caution when several other polymorphisms within the same gene may also alter functionality in vitro and in vivo. This notion may explain some of the controversial findings with regard to associations of individual SNPs in polymorphic genes (e.g. IL-4Rα). The importance of haplotype analysis is further supported by the following studies. Seven SNPs in the IL-13 gene have been shown to be tightly linked , and therefore association studies of individual SNPs with the assumption of independent inheritance cannot easily be performed. Also, several SNPs within the IL-4Rα gene have been identified (see Supplementary Table 3). An association of two individual SNPs (S503P and Q576R) with decreased serum IgE levels was observed in a Caucasian population; however, most significant results with regard to low IgE levels were seen when both SNPs occurred together . Similarly, Ober et al. performed TDT analysis for IL-4Rα SNPs and haplotypes in four populations. Again, the strongest evidence for linkage to asthma and/or atopy was observed with two-locus haplotype analysis . Gene–gene interactions also have to be taken into consideration; for example, when both the genes encoding pro-inflammatory cytokines (i.e. IL-13) as well as their receptors (IL-4Rα) and/or genes involved in signal transduction (STAT6) bear polymorphisms associated with disease. The first studies have demonstrated the feasibility and importance of gene–gene interaction in atopy . A marked disparity in treatment response to pharmacotherapy is observed in asthma (as well as in many other diseases). Variations in genes encoding proteins that interact with specific drugs or drug metabolism are likely to contribute to variability in treatment response. The best examined gene with regard to pharmacogenetics is the gene encoding the enzyme cytochrome p450, for which various alterations that affect the metabolism of multiple drugs have been described. Gene chips for the determination of p450 alleles are commercially available in Sweden and North America (reviewed in ). Pharmacotherapy of asthma and atopy comprises β-agonists, corticosteroids, anti-histamines (H1-receptor antagonists) and leukotriene (receptor) antagonists. The following pharmacogenetic studies have been performed. β2-agonists are the most widely used drugs in the treatment of asthma. They exert their primary effect on the β2AR of bronchial smooth muscle. The gene encoding the β2AR maps to chromosome 5q33 and is the best examined candidate gene with regard to pharmacogenetic studies in asthma. Several SNPs within the coding region and the promoter of the β2AR have been identified (summarized in ; see also Supplementary Table 3). Three mutations that result in amino acid changes of the mature protein (Gly16Arg, Gln27Glu, and Thr164Ile) lead to functional changes. The Gly16 variant was shown to undergo enhanced agonist-promoted downregulation in vitro. Interestingly, a strong association of the Gly16 polymorphism and nocturnal asthma could be demonstrated , which may explain the β2AR downregulation observed in nocturnal asthmatics but not in non-nocturnal asthmatics . Conflicting results have been reported with regard to β2AR SNPs and response to β2-agonists (summarized in Supplementary Table 3). A large multicenter study demonstrated that patients homozygous for the Arg16 variant developed a decline in peak flow when using albuterol on a regular basis . However, a recent haplotype analysis  indicated that β2AR SNPs are not independently transmitted and should presumably not be tested separately for associations with asthma or differences in drug response. Drysdale et al. demonstrated that only a limited number of β2AR haplotypes can be found in several ethnic groups, far less than theoretically possible. Furthermore, response to β2-agonists in asthmatic individuals significantly related to distinct haplotypes but not to individual SNPs. Consistent with the in vivo data, transfection of cells with the β2AR haplotype associated with a better response to β2-agonists resulted in significant greater mRNA levels and β2AR receptor density compared with the lower response haplotype . Despite the large variability in the steroid response of asthmatic individuals, genetic variations in the glucocorticoid receptor gene have as yet to be identified in steroid-dependent asthmatics. No functionally relevant polymorphism has been found in the H1-histamine receptor gene . However, a functional mutation in the gene encoding the histamine-degrading enzyme N-methyltransferase has been related to asthma . Leukotrienes (LTC4, LTD4, LTE4) contribute to airway inflammation and bronchoconstriction in asthmatic individuals. 5-lipoxygenase (5-LO) (gene symbol, ALOX5; chromosome, 10q11.2) is a crucial enzyme in the synthesis of leukotrienes. The activity of 5-LO determines, at least in part, the concentration of leukotrienes in the airways. Drazen et al. described frequently occurring mutations in the 5-LO promoter (three to six tandem repeats of an Sp-1 binding site, with the wild-type allele having five copies) that result in a decreased transcriptional activity. In patients with asthma, only those individuals that expressed the wild-type 5-LO promoter responded well to therapy with a 5-LO inhibitor (ABT-761, the drug was never marketed), whereas individuals with both 5-LO promoter alleles mutated showed no significant improvement of lung function when treated. It has not yet been examined whether these mutations also affect the responses of asthma patients to leukotriene receptor antagonists (e.g. montelukast, zafirlukast). Sanak et al. described a polymorphism within the leukotriene C4 synthase promoter that resulted in higher risk of aspirin-induced asthma. This genetic variant may also alter response to treatment with drugs directed against leukotrienes . In conclusion, the studies by Drazen et al. and Drysdale et al. in particular indicate that genetic testing may help to predict drug response and may eventually be used to optimize individual pharmacotherapy. Apart from pharmacogenetic studies, the analysis of gene–environment interactions to date is hypothesis driven. The difficulties in quantifying and characterizing environmental risk factors for atopy (including onset and length of period of exposure) make these studies a challenge. Very high numbers of affected and unaffected subjects carefully characterized (longitudinally) for both the environmental setting and disease expression may be required to test for interactions between genetic variants and non-genetic influences. However, recent genetic studies support the 'hygiene hypothesis', which postulates that atopy may be the result of a misdirected immune response in the absence of infection. First, resistance to Schistosoma mansoni  and Plasmodium falciparum blood levels  (two independent studies) were linked to chromosome 5q31-33, a region (containing the IL-4 cytokine gene cluster) that has shown strong evidence for linkage to atopy-associated traits. Furthermore, a major locus closely linked to the interferon-γ receptor gene appears to control the switch from a T helper 2 to a T helper 1 cytokine profile during S. mansoni infection [33,34]. Second, SNPs within the FcεRI-β gene have been related to increased total serum IgE levels in heavily parasitized Australian aborigines, indicating a protective role in parasitic infection . These SNPs have also been related to asthma, bronchial hyperresponsiveness, AD and atopy (see Supplementary Table 3). FcεRI-β maps to 11q13, a region that showed evidence for linkage to asthma and associated traits in multiple studies (Supplementary Table 3). Finally, a polymorphism in the β2AR encoding gene (Arg16) that has been related to asthma (see Supplementary Table 3) was also associated with higher levels of parasitic infection . Evolutionary pressure with regard to infectious agents has differed significantly between continents. Significant ethnic differences in genes involved in immune defense mechanisms have been reported and may be based on differences in natural selection over the past centuries. Racial differences in genes involved in both host defense and allergic inflammation can best be demonstrated for CC chemokines and their receptors. 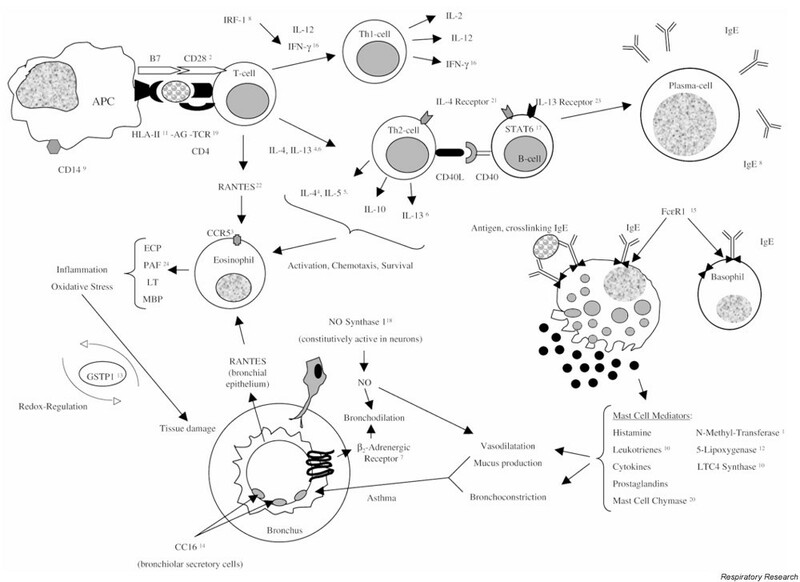 CC chemokines have been shown to be crucial mediators of the allergic inflammation due to their potent chemoattractant properties for eosinophils, basophils and T cells . Observations with regard to ethnic differences are as follows. Evidence for linkage to chromosome 17q11.2 (a region that contains the CC chemokine gene cluster) has been reported in African Americans  but not in any Caucasian population (Supplementary Table 1). A 32 base pair deletion in the CC chemokine receptor CCR5 renders individuals resistant to infection with macrophage-tropic HIV strains. This mutation is found in >10% of Caucasians, whereas it cannot be found in African populations . A reduced risk of asthma was reported for carriers of the CCR5 deletion . However, this could not be confirmed by Mitchell et al. . In contrast to Caucasian individuals, the Duffy Antigen/Receptor for Chemokines is not expressed on red blood cells in the vast majority of African people (a point mutation in the Duffy promoter abolishes erythrocyte gene expression). This confers an evolutionary advantage since Duffy-negative erythrocytes are resistant to infection by Plasmodium vivax, which is endemic in most of Africa. Duffy has been shown to bind with high affinity to chemokines of both the CXC and CC classes, and is believed to function as a clearance receptor for chemokines (reviewed in ). It can therefore be hypothesized that higher or longer exposure to chemokines due to the absence of Duffy on erythrocytes might contribute to asthma pathogenesis in subjects of African descent. A functional mutation in the proximal promoter of the CC chemokine RANTES was significantly more frequent among individuals of African descent compared with Caucasian subjects . This mutation was associated with AD , asthma and atopy . Ethnic differences have also been described for various other genes involved in the allergic inflammation (e.g. IL-4Rα , β2AR ). We can therefore speculate that inconsistent findings in the genetic studies of asthma and atopy summarized in this article may partly be explained by ethnic differences in nature and frequencies of genetic variants in disease susceptibility genes. We can also speculate that ethnic differences in inflammatory genes (in addition to environmental factors) may also underlie the significant worldwide differences in the prevalence of asthma, allergic rhinitis, and AD . Asthma and atopy are complex, multifactorial disorders. Major strides have been made in identifying chromosomal regions and candidate genes linked to asthma. However, the significant increase in the prevalence of atopy-related disorders over the past decades cannot be explained by changes in gene frequencies. It is rather probable that various pre-existing genetic factors interacting with a dramatically changing environment (decline of infectious diseases, change in diet, immunizations, and others) have rendered a large percentage of the population susceptible to asthma and atopy. Genetic variations that evolved to improve resistance to infections may very probably be misdirected to promote allergic inflammation in the absence of infection in Western societies. Redundancies in host defense mechanisms may explain the large number of chromosomal regions as well as a steadily growing number of genetic variants related to atopy. Inconsistent findings summarized in this article may be explained by ethnic differences in host defense genes, but also by limitations to taking gene–gene as well as gene–environment interactions into account. Large prospective, multicenter studies, in addition to retrospective collaborations as described previously , may help to better understand genetic and environmental risk factors for atopy. This article was supported by BMBF grant 01GC0002.